Who hasn’t struggled with knocking out the background of a photo in Photoshop? Zooming in, finely tuning your tool to be the proper size and then frustratingly highlighting the areas you want to save or delete—what a pain! PhotoScissors 1.1 seeks to eliminate the hassle by providing a simple background removal tool. Developer Teorex promises that it only takes a few swipes to highlight the background and foreground, and the algorithm will take care of the rest. In practical application though, PhotoScissor’s algorithm is fine for simple objects like you’d use for eBay or Craiglist advertisements. A few swipes, click Process, and you’re mostly done. You’ll likely still have to do some fine tuning, but PhotoScissors is comparatively much faster than a manual Photoshop background removal. 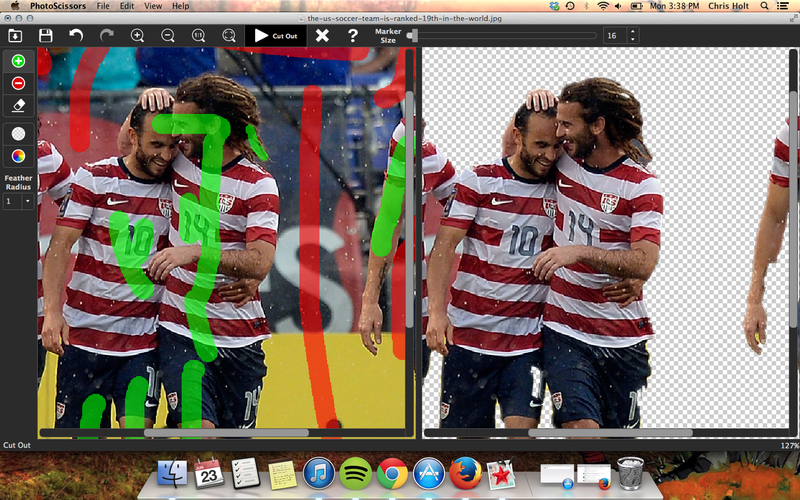 But PhotoScissors struggles with black and white photos and the bane of all Photoshop enthusiasts, objects with hair. There’s a great deal of troubleshooting involved with most background removal jobs involving people. You’ll often add areas to keep and to cut, only to find that the algorithm now interprets your actions as wanting to delete important areas or worse, bring back background you previously thought eliminated. For many jobs, PhotoScissors is a great time saver, but any work that has detailed borders—hair, shadows, etc.—gives it fits. While not quite worth the $20 price tag right now, a few more updates will likely smooth the rougher edges of this app.